A foundational Qigong practice of easeful movements and gentle jiggling to open the spiritual gates (joints) and restore harmonious energy flow throughout the body. This practice is especially beneficial to those seeking to improve digestion, increase lymphatic flow and immune system function, raise energy levels, and enhance mental clarity and emotional joy. All levels welcome and no prior experience necessary. 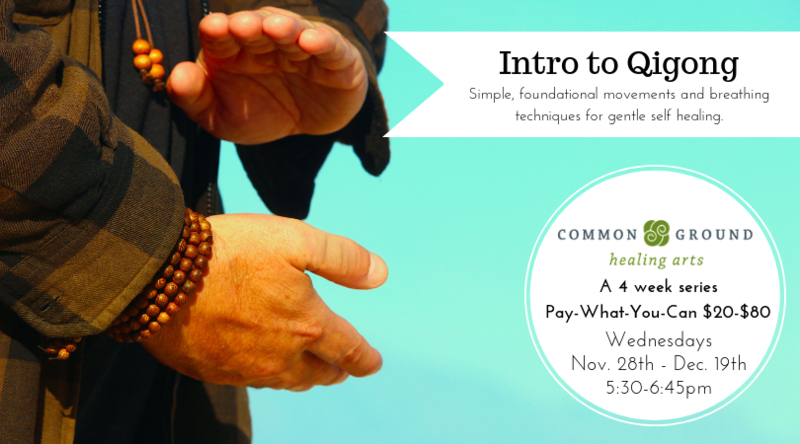 This series will be offered on Wednesdays, November 28th – December 19th from 5:30-6:45pm. About Jay DeMaio: Jay DeMaio guides Qigong as a deep and meaningful inner healing experience. He has over 20 years experience in Yoga, Qigong, and Body Oriented Healing Arts. He has a five year certificate of training in Qigong from Blue Willow World Healing Center. Jay is also a Lymphoma survivor drawing on wisdom from his departure from conventional treatment protocols to his application of Qigong for cancer therapy and chemotherapy recovery.